Fiquei impressionado com o poder de síntese da fig. 1 desse artigo (acima), que me pareceu ser importante para o pessoal da área. Não vou traduzir o abstract, mas recomendo por causa da abordagem reticular no estudo dos efeitos genéticos sobre o cérebro (como diz o abstract, BTW). The network-based approach has been used to describe the relationship among genes and various phenotypes, producing a network describing complex biological relationships. Such networks can be constructed by aggregating previously reported associations in the literature from various databases. In this work, we applied the network-based approach to investigate how different brain areas are associated to genetic disorders and genes. In particular, a tripartite network with genes, genetic diseases, and brain areas was constructed based on the associations among them reported in the literature through text mining. 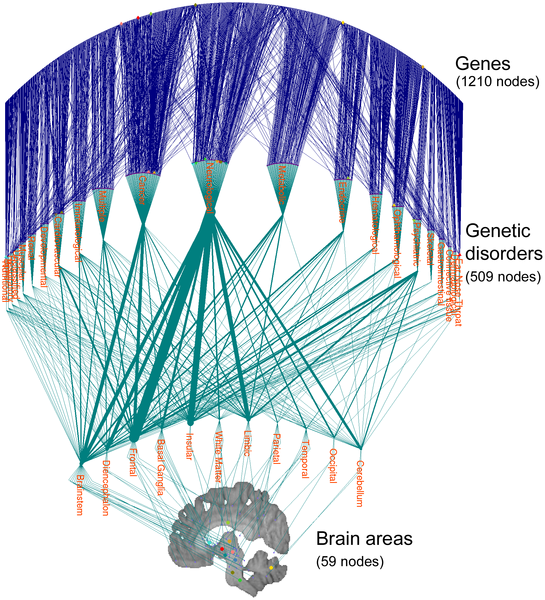 In the resulting network, a disproportionately large number of gene-disease and disease-brain associations were attributed to a small subset of genes, diseases, and brain areas. Furthermore, a small number of brain areas were found to be associated with a large number of the same genes and diseases. These core brain regions encompassed the areas identified by the previous genome-wide association studies, and suggest potential areas of focus in the future imaging genetics research. The approach outlined in this work demonstrates the utility of the network-based approach in studying genetic effects on the brain.